ESCI's kit is undoubtedlyone of thefinest F-5 models available in any scale. 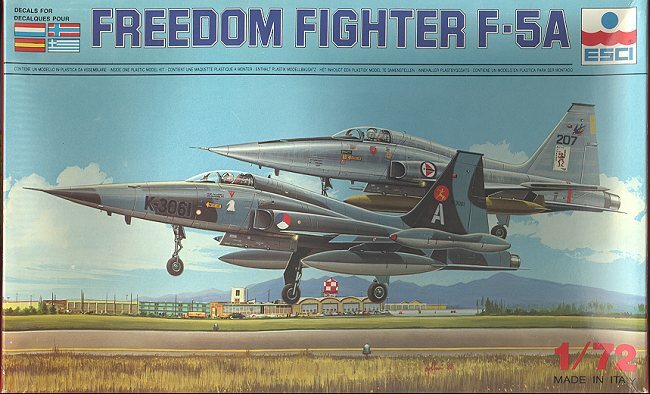 If you are modeling the F-5A it IS thebest in any scale. Initially released in the mid-1980's,the kit has superb detailing consisting of finely engraved panel lines. The kitis designed in a modular fashion to allow for other variants to be kitted usingcommon parts. The cockpit is well detailed with an ejection seat, tub, controlstick and instrument panel. 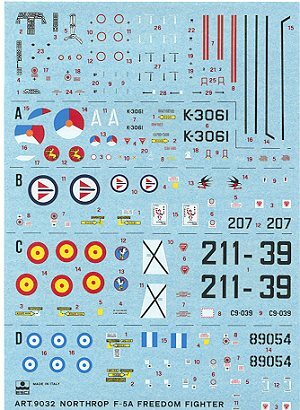 Decals are provided for the instrument panel andside consoles. There is adequate detail in the wheel wells and the speed brakescan be displayed in the down position if desired. The kit also has alternatenose landing gear for the Dutch NF-5A. There are also additional rear fuselagescoops for the NF-5A. You have a choice of either fuel tanks or Sidewinders for the wing tips. Thereare also underwing pylons, though there are only fuel tanks for the inner pylonssupplied with the kit. You'll have to come up with ordnance for the outer pylonsfrom the spares box. There is also a centerline fuel tank provided. Thecockpit canopy can be displayed in the open or closed position. While notincluded in this boxing, there are other boxings of this kit that offer a reccenose option. The instructions are very good, giving a 13 step construction sequence. Colorsare shown for each step. The color chart is very good giving not only a commonname but also the FS 595 equivalent. As is befitting a kit of this aircraft,there are four camouflage options, all of them European. 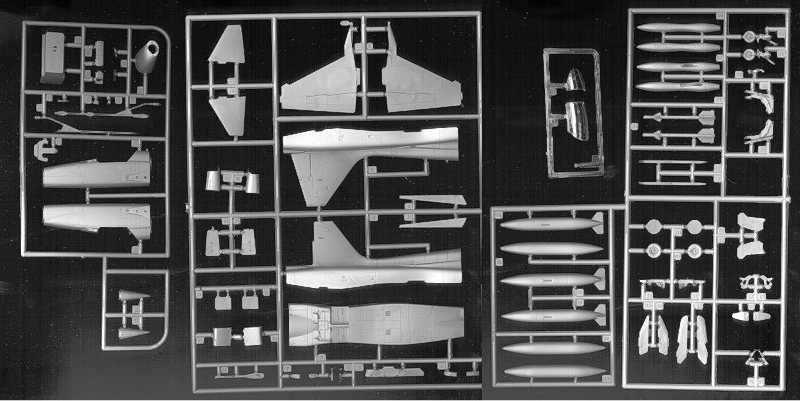 The decal sheetincludes options for a Dutch NF-5A in NATO camouflage, a Norwegian F-5A inoverall silver, a Spanish F-5A in overall silver and a Greek F-5A in a pseudoSEA camouflage scheme. Overall, this is a really nice kit. I have built several and have always enjoyedthe experience. Unfortunately, with ERTL/Racing Champions, the owner of all theESCI molds, in financial trouble, it is unknown if these kits will ever bereissued. If you can find them, buy them. If you would like your product reviewed fairly and fairly quickly by asite that has over 1,100 visits a day, please contactme or see other details in the Note toContributors.